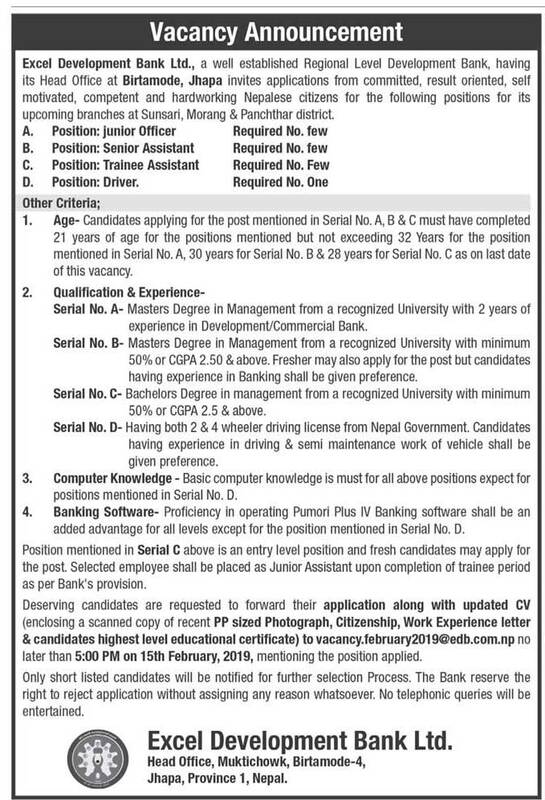 Excel Development Bank Ltd., a well established Regional Level Development Bank, having its Head Office at Birtamode, Jhapa invites applications from committed, result oriented, self motivated, competent and hardworking Nepalese citizens for the following positions for it upcoming branches at Sunsari, Morang & Panchthar district. 1. Age: Candidates applying for the post mentioned in Serial No. A, B & C must have completed 21 years of age for the positions mentioned but not exceeding 32 Years for the position mentioned in Serial No. A, 30 years for Serial No. B & 28 years for Serial No. C on last date of vacancy. - Serial No. A (Junior Officer)- Masters Degree in Management from recognized university with 2 years of experience in Development/Commercial Bank. - Serial No. B (Senior Assistant)- Masters Degree in Management from recognized university with minimum 50% or CGPA 2.50 & above. Fresher may also apply for the post but candidates having experience in Banking shall be given preference. - Serial No. C (Trainee Assistant)- Bachelor Degree in management from recognized University with minimum 50% or CGPA 2.5 & above. - Serial No. D (Driver)- Having both 2 & 4 wheeler driving license from Nepal Government. Candidates having experience in driving & semi maintenance work of vehicle shall be given preference. 3. Computer Knowledge- Basic computer knowledge is must for all above positions expect for positions mentioned in Serial No. D.
4. Banking Software- Proficiency in operating Pumori Plus IV Banking software shall be an added advantage for all levels except for the position mentioned in Serial No. D.
Position mentioned in Serial C (Trainee Assistant) above is an entry level position and fresh candidates may apply for the post. Selected employee shall be placed as Junior Assistant upon completion of trainee period as per Bank’s provision. Deserving candidates are requested to forward their application along with updated CV (enclosing a scanned copy of recent PP sized Photograph, Citizenship, Work Experience letter & candidates highest level educational certificate) to vacancy.february2019@edb.com.np no later than 5:00 pm on 15th February, 2019, mentioning the position applied.